Awesome ! Remind me old hard Megadrive shoot that I played a lot which are looping like Tastujin, Twin hawk etc... Here's my score after one morning training ! Also I didn't notice the bombs in the beginning and I thought it was maybe the most difficult shoot I ever played, I reached to the boss of level 7 without using any bombs ! 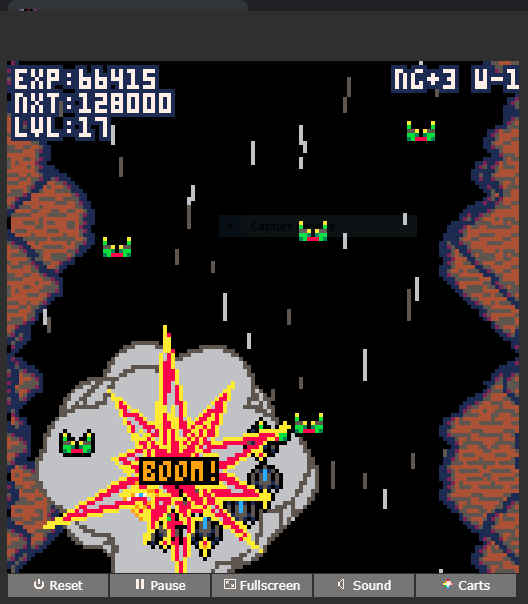 This is now my new favorite shoot 'em up. Thanks a lot for your comments, review and video, Sebastian! It all helps to get more people to play it for sure! Also, check out my other games as well, hopefully you'll find them as interesting as this one. Cheers! I like the game you add some nice twists in by gaining more ships as you level up and boost your firing range. something I noticed though is the bullets don't seem to hurt you if your special attack is charged. Is that intentional? Thanks for your feedback, Keero! The player has a really small hit box, which might be what you're experiencing. Either that or that your side-kick ships don't really get damaged unless they become the main ship (effectively acting as lives stock). Hope that makes sense. Thanks for playing the game and I'm glad you're enjoying it! Awesome game! It was fun to play! Glad you enjoyed it! Thanks for playing it! Thanks! Glad you're enjoying it! I cant get past the 4th boss for the life of me, great game btw! Why is there no download link? Also it might be cool to make your ship a little bit procedural as well. yeah, that was my plan but I ran out of space in the pico-8 cart. i love the variety of enemy designs, are they randomly generated or did you design all of them? They're randomly generated at the start of each level. I'm glad you like it! Rather well made but out of intrest is it an applet or a html game? It gets a bit repetitive after a bit, but it's a very well-made shooter. thank you for your feedback... just curious, how far did you get? I should've played farther than I did...I didn't finish the second level. I'll go back to it and see what comes up in later sections of the game. Cool! I wanna PICO-8! :D You inspire me! The particles flying by make it hard to read what things you have to keep track of, if that makes and sense. It makes visual noise and it's a bit harder to see enemies and bullets coming at you. Hey! I finally played it and it's good stuff! Thanks man! I'm glad you liked it!